At 10:00 on October 30, 2018, Prof. Jiang Lin, from Lawrence Berkeley National Laboratory, was invited to visit CEEP and did an academic report entitled “The dividend of electricity market reform, market influence and transformation policy choice”. This report was hosted by Prof. Bao-jun Tang, many teachers and students attended the report. Dr. Jiang Lin is the Nat Simons Presidential Chair in China Energy Policy at the Lawrence Berkeley National Lab, a Staff Scientist at its China Energy Group, and a Professor at the Department of Agricultural and Resource Economics at the University of California at Berkeley. Dr. Lin's research is focused on energy and climate policy, energy and emissions pathways, electricity market and planning, low-carbon economics transition and appliance efficiency issues in China. He is a co-Director of the Berkeley-Tsinghua Joint Research Center on Energy and Climate Change, a collaborative initiative between Berkeley Lab, the University of California-Berkeley, and Tsinghua University in China. From 2007-2016, Dr. Lin was the Director of the Energy Foundation's China Sustainable Energy Program (2007-2013) and Senior Vice President for Strategy and Analysis (2014-2016). 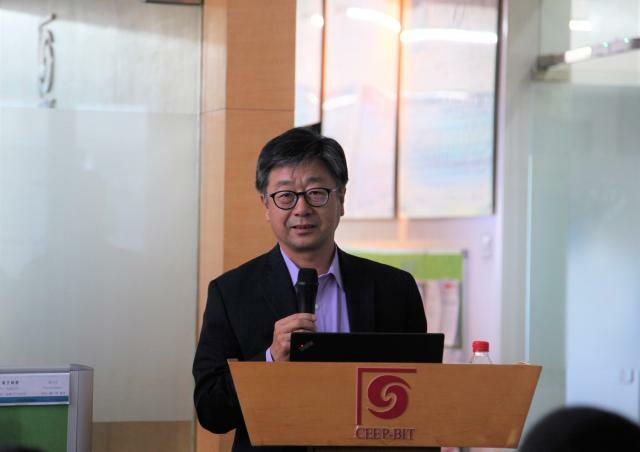 Dr. Lin managed the growth of Energy Foundation China into one of the largest international NGOs devoted to promoting clean energy and climate solutions in China. Before joining the Energy Foundation, Dr. Lin was previously at LBNL from 1994-2007, conducting research in the Appliance Standards and China Energy Groups. Dr. Lin has a PhD in Demography from the University of California-Berkeley, an MS in Population Studies and BS from the Department of Cybernetics Engineering from Xi'an Jiaotong University, China. In today's report, Professor Jiang Lin introduced China has embarked on reforms in its electricity sector that aim to introduce market mechanisms in wholesale pricing. His study provides a quantitative assessment of the impacts of electricity market transition in China on electricity costs and CO2 emissions, as well as the net revenue impacts on individual classes of generators, focusing on Guangdong Province. They find that market reforms deliver significant annual cost savings (21 to 63 billion yuan, 9%-27% reduction in total costs) to consumers in Guangdong, with smaller production cost savings (12 billion yuan, 13% reduction in production costs). Cost savings are driven primarily by reductions in average revenues for coal generators, fuel efficiency improvements for coal and natural gas generators, and natural gas-to-coal switching. Savings for consumers are accompanied by a large reduction in net revenues for various classes of generators, raising concerns about generator solvency, reliability, and emissions. Even with scarcity payment and premium payment to clean energy sources, there are still substantial consumer savings. After the report, Professor Jiang Lin took the picture with teachers and students at CEEP together.